Angelique: We have family in town and everyone wants to meet them. Joyce: So we're going to get all girlie and throw a tea party! Angelique: But we don't want any old bags there. Joyce: Angelique! That is not nice. Angelique: Ma, I'm talking about tea bags. Joyce: Oh, right. No. We don't use tea bags. We're recommending you stop by your local Teavana and test out some of their lovely loose teas. Angelique: They'll let you taste them, usually have some fresh stuff brewed for you to test and they'll even show you how to whip up fresh tea without the bag. Joyce: What I appreciate most about Teavana is that the teas are organic, though not certified by the USDA. Angelique: But now let's get down to the food. Do we really have to do those little sandwiches? Joyce: Yes, the cucumber sandwiches are a tradition. It's a thin spread and they're quite tasty. Angelique: And wouldn't fill up a 4 year old. 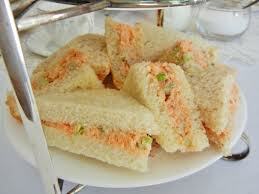 How about we add a nice salmon finger sandwich too? Cause me and my friends like to eat. Joyce: Fine. Now on to another tea time tradition - Scones! Angelique: Ma, you've never made a scone in your life. Joyce: No, but I've got a great recipe and we're going to try it. Angelique: Can't I just whip up some biscuits and jam? Same thing. Joyce: Absolutely not! You are not about to embarrass me. But you can drive down to Trader Joe's and buy a few bags of their orange cranberry scones just in case. · Allow 4 – 6 cut sandwich servings per person. · Select the best quality white or wheat bread. · Freeze the bread before cutting. · Bread slices should be lightly buttered, no matter what filling you are using. · Cut crusts off the bread with a long, sharp knife after the sandwiches are filled. · Cut sandwiches in half on the diagonal then into fourths. Rinse mint leaves, blot dry with paper towels and chop fine. In a small bowl, combine mint, butter and cream cheese. Spread on one side of each slice of bread. Lay cucumber slices onto the buttered side of 8 slices of bread. Sprinkle lightly with salt if desired. Top with the remaining slices of bread, buttered side down. In a bowl, thoroughly combine the flour, sugar, baking powder, salt, and baking soda. Cut in butter till crumbly with a fork or pastry knife. Gently stir in buttermilk just long enough to combine all ingredients. Fold in cranberries and orange zest. Do not over work the dough. Turn onto a floured surface and divide into two parts. Cut each part into six pieces and place on a lightly greased baking sheet. Brush scones with orange juice. 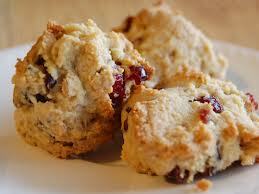 Combine the sugar and cinnamon and sprinkle on the top of each scone. Bake in a 400 degree oven for 15-20 minutes or until golden brown. You can also cut them into circles with a round cookie cutter, but the baking time will be less if you place them on the baking sheet not touching each other. If making sandwiches ahead of time, cover them loosely with a sheet of wax paper and then place a damp towel over the wax paper. 16 Tips to Looking & Feeling Great! you ever have before? Do you want to protect yourself from disease and injury? Trainer and Rehabilitation Specialist. I’m now going to reveal to you the 16 essential strategies that have enabled my clients to achieve the health and fitness goals they always wanted! 1. 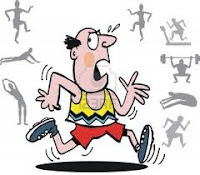 In the beginning, your fitness program should not be overly aggressive. One of the biggest problems people encounter when starting a fitness program is rapidly depleted motivation after only a few weeks due to an overly ambitious fitness program. Attempting to do too much too fast is worse than doing nothing at all! Because then you feel like exercise is too hard and it’s just not for you. Start out slow, maybe just shooting for 1 or 2 workouts a week. Once you have successfully added that to your normal routine, then attempt to slowly add to your fitness program. Plus, most people don’t need to exercise more than 3-4 times a week. That doesn’t mean you can’t exercise more; it’s just not necessary. 2. Always have a detailed plan! In order to reach your health and fitness goals, you must have a road map to follow. I can’t stress this enough. If you are unsure of how to put together a fitness plan, or if you’re uncertain of the effectiveness of the one you have, I highly recommend you consult a professional fitness trainer. With a well thought out plan you are much more likely to be successful! 3. Set realistic, attainable goals. You must have tangible, quantifiable, short and long-term goals so you can measure and assess your progress. Too many people have totally unrealistic expectations of what to expect from an exercise and nutrition program. The best way for you to understand what is realistic and attainable is to talk with a fitness professional – not to buy into the “hype” of infomercials and diet and fitness products that are blatantly misleading. 4. Keep a journal! This is one of the most important things you can do. If you’re not tracking what you’re doing, how will you know what worked? There are quite a few great exercise and nutrition logs I’ve come across. You should keep track of all your exercise and also each day’s food intake. There’s a company called NutraBiotics that makes a great 90-day journal that can be used to track strength training, cardiovascular exercise, and daily nutrition. If you would like more information on this journal, please feel free to call me at 240-731-3724. 5. You must be accountable! Set exercise appointments with yourself if you’re not working with a personal fitness trainer. Use your appointment book to set aside times for exercise, just like you do for meetings or events. Don’t let things get in the way. Nothing is more important than your health! If you don’t have your health you can’t effectively do anything. I often have mothers tell me that they can’t find time to exercise because they have to take care of their children. I have 4 daughters myself, and a baby on the way, so I know exactly how hard it is. Whatever your situation is, making the commitment to exercise and your health IS possible, and very important. Plus, it sets a great example for the children! 6. Remember the benefits of exercise. Being physically fit affects every aspect of your life: you sleep better, eat better, love better, overcome stress better, work better, communicate better, and live better! Remember how good it feels to finish a workout, and how great it feels to meet your goals! 7. Exercise safely and correctly. So much time is wasted doing, at best, unproductive exercise, or at worst, dangerous exercise. Educate yourself on how to exercise correctly. The best way to do that is to hire a personal fitness trainer. It could be for just a few sessions to learn the basics, or it could be for a few months to learn everything. It’s completely up to you. But statistics prove that those who understand how to exercise correctly get better, faster results. And that’s what you want, right? 8. Enjoy your exercise! For example, if you hate doing strength training, try to find ways to make it more enjoyable. Circuit training might be a more fun and exciting way to fit this important part of fitness into your program. The key is you should enjoy it, and if you don’t you need to look for other exercises or activities to replace whatever it is you don’t enjoy. If you don’t enjoy it, how do you expect to stick with it? 9. Make time to stretch! It has so much benefit and takes very little time. So many people suffer from various aches and pains of which most can be eliminated by basic stretches! Try to spend at least 5 minutes after each workout stretching. For more information on stretching and how it eliminates aches and pains, please call 240-731-3724 to request a FREE copy of my special report “No More Back Pain”. 10. Don’t think you need to exercise 5 days a week! I touched on this earlier. Many people feel they’re getting fat because they’re not exercising. Totally not the case! Exercise is not the answer! It’s all in your eating habits. However, exercise can aid in burning body fat, plus there are numerous health benefits. Think of exercise as a bonus. How many people do you know who exercise 3-5 times per week, but still fail to meet their weight loss and fitness goals? I’ve met hundreds! First look at your eating habits, such as: when you eat, what you eat, how much you eat, where you eat, and how often you eat. 11. Never skip breakfast, or any meal! If you want to maximize your fitness or fat-loss efforts you’ve got to eat breakfast! So many people skip breakfast, and it’s the worst thing you could ever do when it comes to fat-loss. Skipping meals throws your blood sugar all out of whack and it sets you up to store your next meal as fat, almost guaranteed! 12. 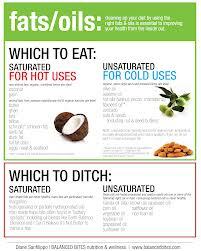 Eat fat to lose fat. Healthy fats are necessary to your body for numerous reasons: regulating hormonal production, improving immune function, lowering total cholesterol, and providing the basics for healthy hair, nails, and skin. 13. Drink plenty of fresh, clean water. Yes, I know that you have probably heard this one over and over again. But there’s a reason for that – it’s that important! The recommended daily intake of water is 8 glasses, or 64 oz. You should even be drinking even more if you are active or exercise regularly. And no, soda, juice, coffee, and tea DON’T count! Nearly every chemical process place in your body, takes place in water! Proper blood flow and digestion are both affected by how much water you drink, and poor blood flow and digestion can be linked to numerous health conditions. 14. Stabilize your blood sugar! If you want to burn fat and prevent your body from putting it back on, you must stabilize your blood sugar. In order to do this you need to eat small, balanced meals or snacks every 2-3 hours. Fasting, skipping meals, and overly restrictive diets will enable you to lose weight – in the short run. The weight you lose is primarily water weight and muscle tissue, and in the long run has opposite effect of what you want. When you restrict your diet, your body instinctively thinks it’s being starved and shifts into a protective mode by slowing down the metabolism and storing nearly all calories as body fat. Plus, losing muscle tissue is the last thing you want to do. Muscle burns calories, even while you sleep. You should be focused on increasing, or at least maintaining muscle tissue. 16. Get the help of an expert! Obviously, meeting your health and fitness goals is important to you, so why not eliminate the guesswork and start seeing the results you have always wanted? With the help of a qualified professional you can! If your car breaks down, where do you take it? Mechanic, right? How about if you have a cavity? Dentist. So why is it that so many people attempt to solve their health and fitness problems without consulting an expert? I don’t know exactly, but I encourage you to make the investment in yourself- in your life- by hiring a professional to educate you and help you meet your goals. So there you have it. The 16 essential strategies for an effective weight loss and fitness program that will have you looking and feeling great! Season the roast with salt and sit aside. Place the peppercorns, coriander, cumin and onion flakes in a coffee/spice grinder, grind until seeds are cracked add the remaining spices and sugar and grind until they are well mixed. Place the spices in a large dish or bowl and roll roast in spices until well coated. Wrap roast in plastic wrap or foil and let marinate over night. Heat a large pot on high, add the oil, once the oil is heated, add the roast and brown on all sides. Lower the heat and add the vegetable stock, onions and garlic. Cover with a tightly fitting lid and let simmer. After 1 hour of cooking, turn roast with tongs (do not pierce with a fork because you will release the juices), cook another 30 minutes and turn again. After 1½ hours of cooking, add the potatoes and carrots, season with salt and pepper and continue to cook until potatoes are fork tender. Plating: On a very large platter, place the roast and surround it with the vegetables. 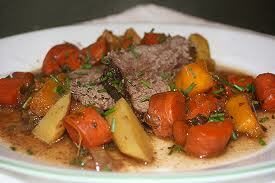 A nice little twist is to use sweet potatoes or yams instead of white potatoes. Using an immersion blender or food processor, puree the soup and then return it to the pot. Stir in the lime juice, cover and keep warm. 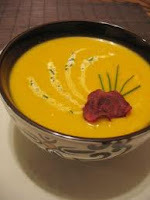 Note: Soup can be cooked 2 days in advance, just reheat and puree prior to serving. Roast asparagus until just crisp/tender, about 8 - 12 minutes, depending on size. 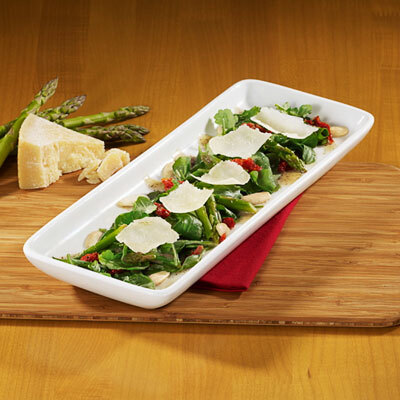 Combine arugula, asparagus and sun dried tomatoes in large bowl. Transfer salad to platter; add shaved cheese. Avoid Packing On Winter Weight! Angelique: I love this time of year because we all curl up in front of the TV and eat like pigs. Joyce: Yes, even in health conscious LA where it's 75 degrees today, we indulge in winter comfort foods. Angelique: There's nothing wrong with it until Spring comes and you realize the only thing you can fit are your fat clothes hanging waay in the back of the closet. Joyce: We've got a remedy for that. It's called soup and salad. 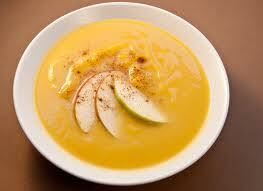 A nice healthy soup and salad will help you control your appetite and eat less when the steak and potatoes come. Angelique: "Why would I want to eat a lot of salad and not have room to eat all my steak?" Joyce: Well because if you're at a restaurant, the portion size they're serving you is probably 2 or maybe 3 meals worth of food anyway. Split it up and eat the rest later. Angelique: Then at the next meal you eat your healthy salad, soup and a little more of the steak and potatoes. Joyce: By the end of the day, you've gotten in lots of vegetables. And you've taken 1 big meal and split it into 2 or 3. Which means by the end of winter, you'll be wearing your skinny clothes. Angelique: Even Progresso is touting that soup makes you lose weight. Though we would not recommend any of those salt-filled, processed soups. Joyce: We've got all kinds of great recipes for soup. Make a few pots and freeze them for the winter. Angelique: And don't forget if you're piling on the cheese, meat and ranch, you're missing the point of the salad. It's supposed to be healthy and light. And while you're sitting on the sofa watching your shows pick up hand weights or cans during commercials and work out those arms. yeah, mom's going to have arms like Angela Basset as much as she watches TV. Combine all vegetables and fruit in a large bowl. Whisk together the lemon juice, olive oil, salt and pepper until thoroughly combined and dressing thickens. 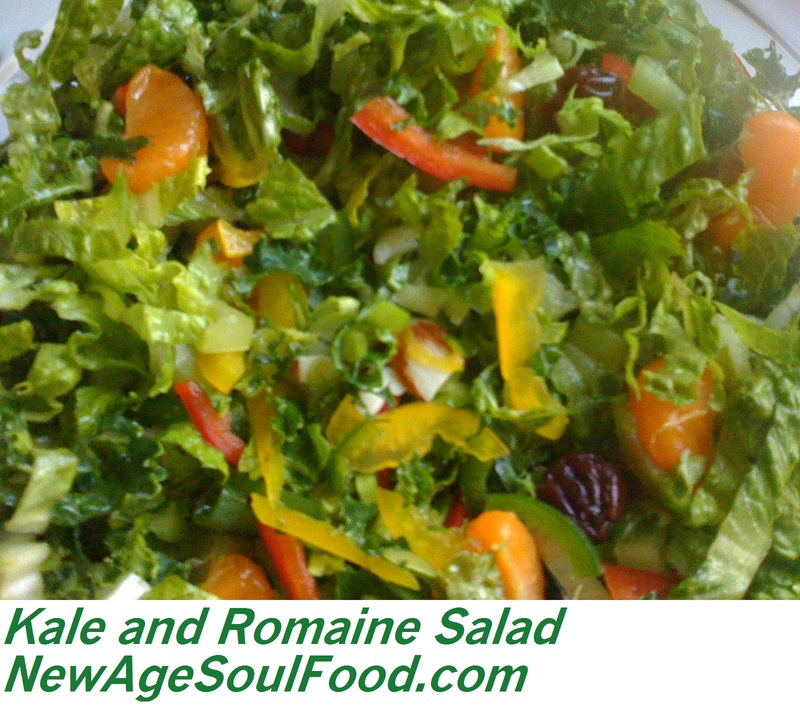 Pour over salad, and let it marinate for an hour before serving. 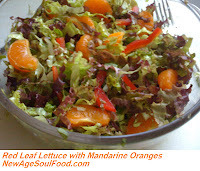 Place lettuce, pepper and orange segments in a medium bowl. Whisk together the orange and lemon juice, olive oil, salt, garlic and chili peppers. 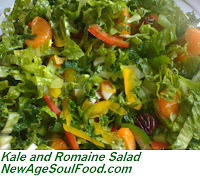 Pour over salad just prior to serving. Place all vegetables and dill in a medium mixing bowl. Whisk together the lemon juice olive oil and sea salt until dressing thickens. 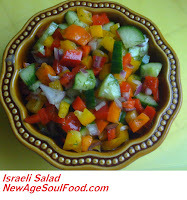 Pour dressing over salad and add some fresh ground pepper. Mix thoroughly and let it marinate in the refrigerator at least an hour before serving. 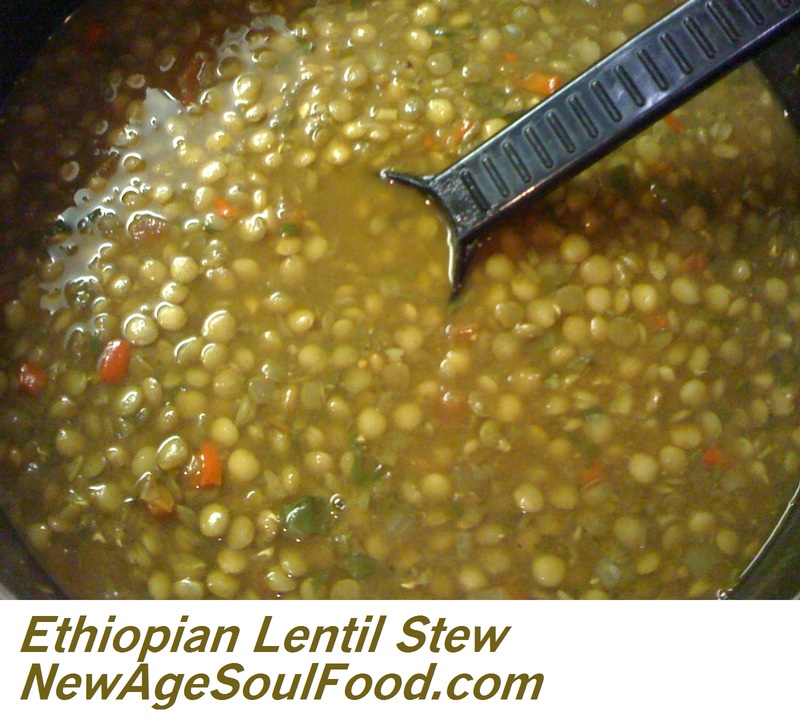 Note: Traditionally this stew is made with red lentils, I just didn't have any. Heat oil in a large Dutch oven over medium heat. Add onion to pan and cook 15 minutes or until tender, stirring occasionally. Add ginger and garlic and cook for 5 minutes, stirring frequently. Stir in tomatoes and Berbere spice, cook 1 minute, stirring to combine. Gradually add water, and whisk until blended. Increase heat to medium-high; bring to a simmer. Rinse lentils until cold water and drain. 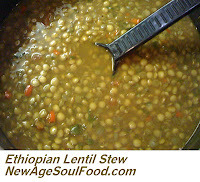 Add lentils and salt to pot and simmer, partially covered, 45 minutes or until lentils are tender, stirring occasionally. Once lentils are done, stir in the cilantro and remove from heat. Serve over brown basmati rice.